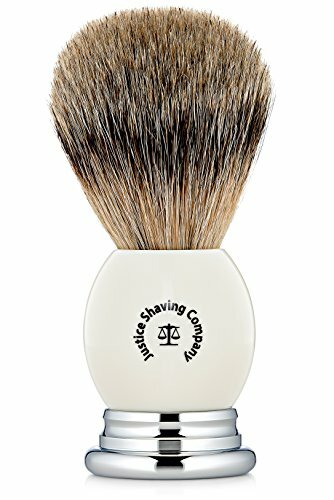 Justice Shaving Company’s (JSC) Super Badger Brush with White Handle is one of the highest quality brushes available – an elite brush offered for an affordable price. Super badger shaving brushes are highly sought after due to their ability to hold warm water and bring it to the surface of the skin ensuring that facial pores remain open, moisturized and lubricated for a fine shaving experience. A super badger brush works up a rich, dense lather and gently exfoliates the skin, cleaning open pores and removing dead skin as the shave soap lather is worked into the beard, softening the hair and providing protection and lubrication for a smooth glide of the razor across the skin surface. Many wet shavers start their shaving career with a synthetic or boar hair shaving brush and upgrade to “Pure Badger” or “Best Badger” hair once they have the shave bug, but they set their sights on super badger or silvertip as their ultimate dream brush. JSC’s Super Badger Hair Shaving Brush with White Handle is offered at a price point that allows the average consumer to experience an elite shave. Regarding the difference between Super badger bristles and Silvertip badger. The quality and performance of Super badger is far superior to Pure badger and Best badger. Super badger performance is nearly identical to that of Silvertip badger hair brushes, the primary difference is in the coloring: while similar looking, Silvertip is more distinct in its banding than Super badger. If the color is less important than the performance, Super badger is the best shaving brush quality for the price. Some brushes claiming to be high quality will shed for many months or years. This handmade brush may shed a couple of hairs during the first couple of weeks of use, as will any natural animal-hair shave brush, but beyond that the brush will not continue to shed. Add to cart now for your best shave ever! This entry was posted in Wet Shave and tagged Badger, Brush, Company's, Experience, Foundation, Great, Hair, Handle, have, Justice, Premium, Shave, Shaving, Super, White.